BACK UP CAMERA, BLUE TOOTH WIRELESS. The 2009 Audi Q5 was the German automaker's first compact SUV. Coming so late to the party, the Q5 hit the ground running, offering state-of-the-art multimedia and upscale amenities one would expect from a premium SUV. The 2012 Audi Q5 is an eye-catching 5-passenger SUV that takes its styling cues from its older sibling, the Q7. While it's not the ideal SUV for large families, the Q5's sophisticated design and nimble driving characteristics ensure its place as a top contender in the highly contested luxury SUV segment. If you seek a compact luxury SUV and striking exterior styling is your primary demand, look no further than the 2012 Audi Q5. The interior layout is simple, yet elegant. Navigating tight spots is an effortless task thanks to the Q5's compact dimensions and relatively tight turning radius. For 2012, the V6 models add a sleek S line package with titanium-finished 20-inch 5-spoke wheels, matte black roof rails, and window frames. The top-of-the-line Q5 Prestige model offers new rear-window sunshades, perfect for keeping your rear-seat passengers comfortable in the summertime. A satisfying balance of ride comfort and dynamic handling has traditionally required compromises on both sides of the equation, but technology continues to rewrite the rules. While the BMW X3 and Lexus RX 350 hold down the segment's extreme positions on the sport-comfort spectrum, respectively, the 2012 Audi Q5 offers a range of proficiency that approaches both ends. And that range is delivered by more than just the powertrain and suspension, but also by the outward visibility and ergonomics, and the "driving sensation" we consistently highlight when talking about European cars. The Q5 also adds a dose of customization to the driving experience when outfitted with its category-exclusive "Audi drive select" feature - highlighted in the Favorite Features section of this review. At the push of a button, Q5 drivers can adjust the engine, transmission and steering characteristics to satisfy their personal preferences. Modes include Comfort, Automatic, Dynamic and Individual, which allows a custom-tailored setting on navigation-equipped models. In a tight parking lot, you want a lot of steering assist and response. When bombing down the autobahn, you want subtle directional changes and a calm steering response. With Audi dynamic steering, the 2012 Q5 has variable assist and variable ratio, delivering the best of both worlds. The system can even provide minor steering corrections in extreme situations, reducing the need for electronic stability program intervention. The 2012 Audi Q5's visually striking exterior is nearly eclipsed by its brilliant interior architecture. The layout is polished and classy, with precise construction and excellent fit and finish. The 12-way power front seats offer a host of configurations to accommodate an array of body types. The rear seats feature a versatile 40/20/40 split design and provide ample legroom and headroom. Audi is leading the way when it comes to innovative in-vehicle multimedia. The available feature-packed navigation system is controlled by Audi's intuitive MMI terminal and includes 3D building graphics, DVD player and two SD card slots. Although the compact luxury SUV segment offers a variety of stylish choices, the 2012 Audi Q5 is the clear winner when it comes to innovative design. In line with Audi's current design language, the Q5 features the distinctive Singleframe grille design, clean lines and of course, Audi's infamous LED daytime running lights. The Audi Q5's perfect height and large alloy wheels create a muscular stance once reserved for sports cars. We also like the Q5's sedan-like LED taillights and unique "clamshell" power liftgate. 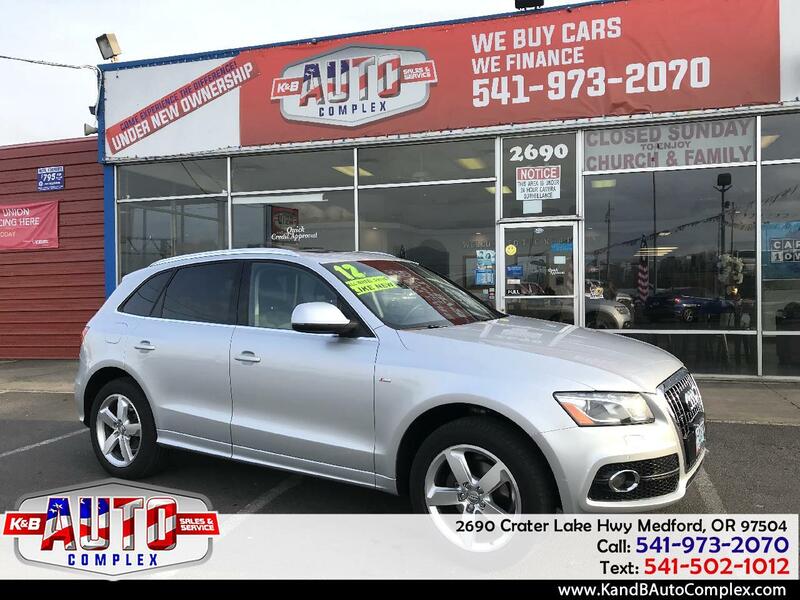 Every 2012 Audi Q5 features plush leather seating, power front seats with 4-way lumbar support for those extended road trips, 3-zone climate control, multi-function steering wheel to help keep your eyes on the road, and a 10-speaker audio system with SiriusXM Satellite Radio. Standard safety equipment includes six airbags along with electronic stability control that adjusts for a higher center of gravity when it detects the roof-rack crossbars are in place.